I bought this plate at a local gift shop this week. It spoke to me. It said, “Hey, Brenda, I’m perfect for you. Remember your video.” Well, maybe the plate didn’t talk to me. Maybe it was the Holy Spirit reminding me of how perfect it was for me, because that is how much He cares about the details in our lives. Whatever the source of the prompting, I bought the plate. Last summer I made a video (actually had it professionally made) in which I share a few things I believe God is trying to teach me while I’m still on earth. These are things I struggle to absorb into the core of my being. The last thing on the list is “enjoy today.” When I saw the plate I had to buy it. 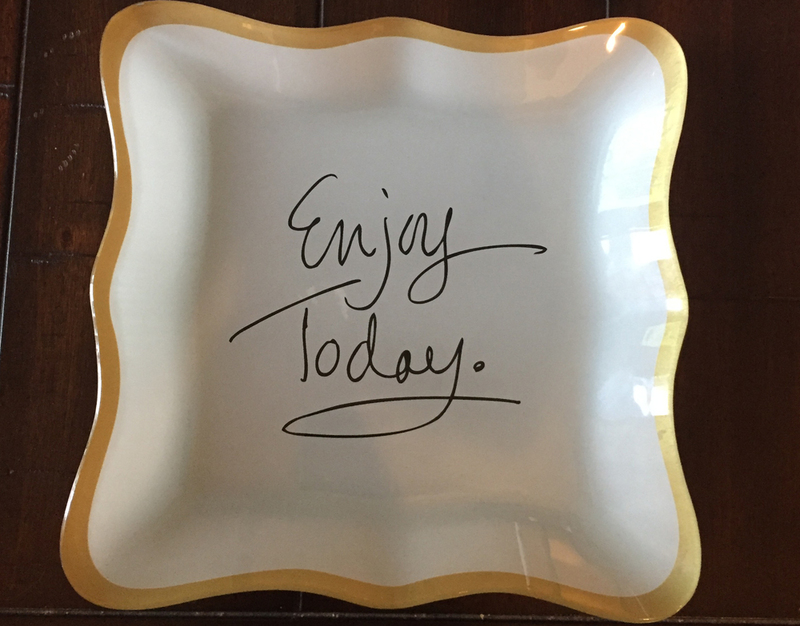 The plate is a beautiful reminder to me to lighten up and enjoy all the wonderful gifts God has put in my day. An impromptu lunch with a friend I ran into while running errands. The carload of groceries I bought today. Phone calls from two of our three daughters. I am overly blessed. Truly I am. This plate will help me refocus on the blessings that I can sometimes overlook. This entry was posted in faith, God is faithful, God's love, Intentional Living, Joy, Priorities, What God Wished I Knew and tagged Brenda Garrison author, encouragement, Faith, God, Intentional living, joy, trust God, What God wished I knew. Bookmark the permalink.